Our motto is: Repair! Don’t Replace !! Bush Road, St. Maarten – GFR Enterprises, owner and operator of several websites such as AirSXM.com, AirStMaarten.com, SharedCharters.com, AllCaribbeanCharters.com, StMaartenCatering.com, StMaartenFlowers.com, StMaartenGifts.com and StMaartenGiftBaskets.com is now launching a totally new online web business called KwikFix.com . Visit Kwikfix.com for when you need a kwik-fix in and around your home, house, villa, condo, apartment or business. We now have an auto mechanic to do car repairs also. We personally select our handymen, specialists and contractors to ensure reliability, trustworthiness and expertise so that when we send a handyman, a specialist or a contractor you can be sure that the job will be done right, on time and that the project will be handled with the utmost care and total responsibility. Use our form below and sign up today! Minor plumbing Leaky faucets, repair/replace fixtures, toilet repair, minor drain problems, heater/boiler install, refrigerator repair and install (ice maker lines). Minor electrical Ceiling fan repair and install, electrical plugs and switches, vanity lights, motion lights, cable and phone line installation, water heater repair. Fence repair Metal and wood fence repair and install, electric fences, gate and latch install. Window, wall and door repairs Locks install/ repair, small hole repair, door installation, window maintenance and repair. Decks and patios Deck repair and maintenance, chemical cleaning, pressure washing, wood replacement, handrail installation. Painting Interior and exterior (short of an entire exterior of a house). Weather proofing Weather stripping, caulking, hurricane shutters setup, install, repairs, etc. Flooring Tiling (laying of tiles), carpet and hard wood repair. Exterminating Flitting and chemical treatments (termites, woodlice, insects, bugs, rodents). Welding Iron (bars/gates), metal, steel welding needed in and around the property. When we send a Handyman to do a Kwik-Fix, we pay the handyman and invoice you after the job is done completely. We will invoice and bill you seperately for all parts, materials and other expenses and costs incurred. 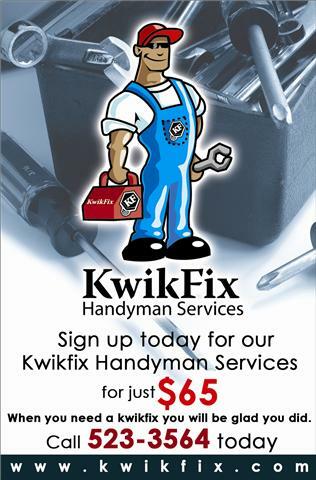 Sign up today because you never know when you will need a Kwik-Fix! 10 Protected areas/regions/districts available to serious interested parties. A one-time franchise fee and yearly royalty required. Contact us for an interview, executive summary and business prospectus. Email info@kwik-fix.com or call us today via (721) 543-1028 or call day or night (721) 527-7966.